Telligen conducts unique analysis to determine cost-savings & impact of diabetes education among disadvantaged Medicare populations. Disease management programs, particularly for diabetes care, have long been recognized by payers as an effective method for improving the health of patients with chronic disease. For example, the Medicare program offers diabetes self-management education (DSME) to help beneficiaries monitor blood sugar, control diet, and manage prescriptions. Although most experts acknowledge DSMEs short-term benefits, there’s little research that specifically focuses on older, rural populations most likely to experience adverse outcomes — until now. A team of data analysts from Telligen analyzed DSME delivered within a state-based quality improvement program to calculate cost-savings for the Centers for Medicare & Medicaid (CMS). The study analyzed the impact of DSME delivered through Everyone with Diabetes Counts, now a nationwide disparities reduction program administered through CMS quality improvement organizations. Results showed that beneficiaries who completed the DSME program had 29 percent fewer hospitalizations compared to a control group of diabetic beneficiaries that did not participate. As a result, cost-savings to the Medicare program totaled nearly $40,000 per 100 beneficiaries completing DSME. The interest in calculating cost savings for quality interventions has grown substantially over the years, said Kim Irby, Telligen’s Director of Health Management and research team member. “Our hypothesis was that diabetes has such a profound influence on overall health status that improved management would have implications beyond prevention of diabetes-specific diagnoses,” says Irby. 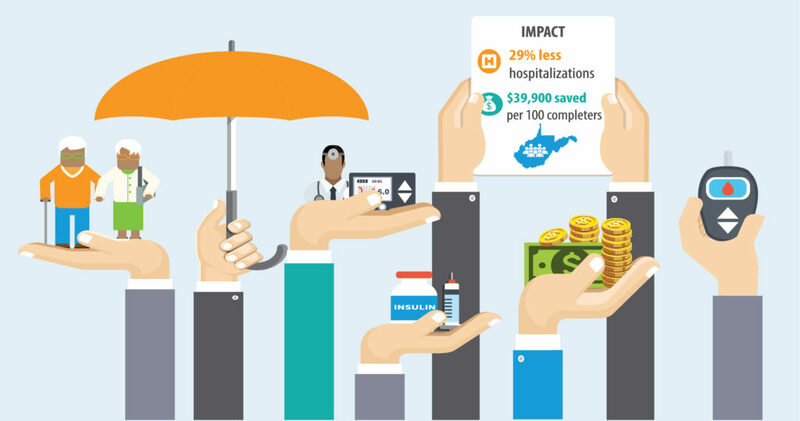 By capturing the elements necessary for calculating savings, data from West Virginia’s EDC program presented the perfect opportunity for Telligen’s data analysis team. The study became the first-of-its kind to calculate DSME cost-savings as it relates to older, rural populations. The Telligen study is also one of few that incorporates cost-drivers, such as hospitalizations, specific to this population. As CMS continues seeking actionable evidence on reducing disparities, the Telligen team is looking to reproduce the data to show a national impact. The study was conducted by Telligen’s data analytics team in Colorado: Kim Irby, Jane Brock, Medical Director; Lori Silveira, Lead Biostatistician; Lijing Zhang, Senior Biostatistician; Beth Stevens, Biostatistics Manager; Lacey McFall, Program Specialist; and Andrew Perlman, Data Analytics Manager.